The Comet Cruiser is a shuttle bus serving UT Dallas and the surrounding community. You do not need any sort of pass or identification to use this bus, but other bus and train routes do require a DART [Dallas Area Rapid Transit] Transit Pass. Service runs 7:00 a.m. - 11:00 p.m.
Service runs 7:00 a.m. - 1:30 p.m. and 3:30 p.m. - 7:00 p.m.
Departs from the intersection of Dickerson St. & McCallum Blvd. 7:05 a.m. is the first departure time from the intersection of Dickerson St. & McCallum Blvd. 11:05 p.m. is the last departure time from the intersection of Dickerson St. & McCallum Blvd. 7:00 a.m. is the first departure time from the transit center near the Visitor Center and University Book Store (VCB) and the intersection of Dickerson St. & McCallum Blvd. 11:00 p.m. is the last departure time from the transit center near the Visitor Center and University Book Store (VCB) towards the intersection of Dickerson St. & McCallum Blvd. Departs from the Walmart Supercenter at 425 Coit Rd. 7:00 a.m. is the first departure time from the transit center near the Visitor Center and University Book Store (VCB), the intersection of Dickerson St. & McCallum Blvd., and the Walmart Supercenter at 425 Coit Rd. 11:00 p.m. is the last departure time the Walmart Supercenter at 425 Coit Rd. towards the Frankford @ Osage Plaza DART [Dallas Area Rapid Transit] Stop. This is also the last departure time from the transit center near the Visitor Center and University Book Store (VCB) towards the intersection of Dickerson St. & McCallum Blvd. 7:12 a.m. is the first departure time from the intersection of Dickerson St. & McCallum Blvd. 10:42 p.m. is the last departure time from the intersection of Dickerson St. & McCallum Blvd. Service runs 10:00 a.m. - 6:00 p.m.
Departs from Walmart Supercenter at 425 Coit Rd. 10:00 a.m. is the first departure time from the transit center near the Visitor Center and University Book Store (VCB) and from the intersection of Dickerson St. & McCallum Blvd. 10:12 a.m. is the first departure time from the Walmart Supercenter at 425 Coit Rd. 6:12 p.m. is the last departure from the Walmart Supercenter at 425 Coit Rd. Ring the bell when you want to get off the bus. Buttons/pull-cords for ringing the bell are located throughout each bus. When you ring the bell, your bus driver will stop at the very next bus stop, so be sure to ring the bell before your stop. If your bus driver doesn’t hear a bell for a particular stop, and no one is waiting at that bus stop, he/she will drive past it. You can text your bus stop’s unique number (e.g. 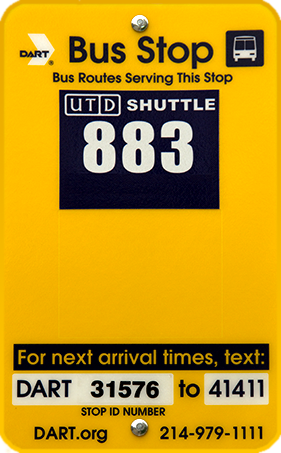 : “DART 31576”) to 41411 for a return text with information on when the next buses are expected to leave from your stop; Instructions for this are posted at each bus stop. Please remember, since all posted times are for when a bus leaves a particular stop, you should plan to be there a few minutes before then.